How long does it take you to turn out a new model? Days? Weeks? You might be surprised to learn that 18 months are required to develop a new ready-to-fly plane like the Thimble-Drome Piper Super Cub 105. Here, Roy Cox (far left) confers with his engineer and draftsman on new .02 cubic inch Pee Wee power plant. Roy usually test hops all new models; he's also a talented full scale pilot with his own Navion. Every 30 seconds, 24 hours a day, 7 days a week the molding machine below forms a set of elevators, rudder, struts and bellcrank for the "105". Looking much like prehistoric animal tracks you've seen preserved in stone is the imprint of the Cub's wing and fuselage. This 1½ ton steel mold receives final touch from skilled mold maker. Weeks of cutting and polishing with gem-hard tools preceded this last step. Sometimes $50,000 may be spent before a mold is judged ready for work. In the case of the Super Cub, eight preliminary tests, involving mold and part changes and consuming four months were required. Injection molding machines are another expensive item costing upwards of thirty thousand dollars apiece. How can a model engine be made to sell for $3.95 when the manufacturer receives less than half that sum? Ingenious manufacturing and rigorous cost control are two answers. The Cox concern utilizes 14 multiple screw machines (right). Parts are produced in a bath of oil to control temperature and eliminate friction. Up to 1,000 an hour come oft these machines. In a temperature-humidity controlled room where the air is washed and filtered pistons and crankshafts are ground, cylinders inspected and honed. Tolerances of 7-millionths of an inch are the order of the day. Special purpose machines eliminate costly time-consuming hand operations. Above, an automatic slide feed permits operator to fix a prop drive washer to crankcase housing with minimum of movements. Center right, machine tightens all four screws on a carburetor plate in ci single movement with adjustable torque on each screw. Finally (right) plastic planes and Thimble­Drome engines meet on the assembly table. In foreground, spring starters are attached to power plants; in background, wheels and bellcranks are added. Maybe your workshop needs a turntable? 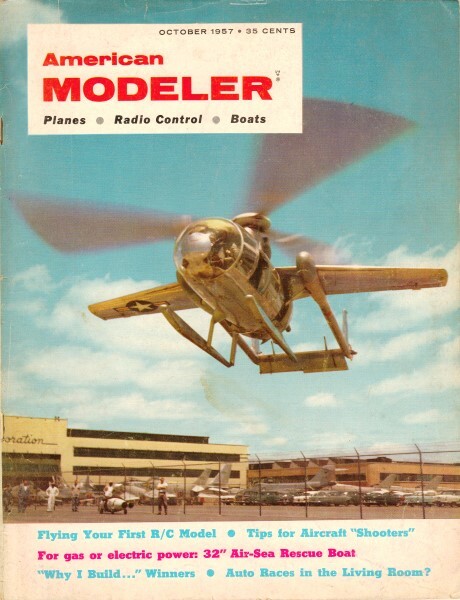 • Read of the public unveiling of the Cox Babe Bee from the April 1957 American Modeler. • Here is my Golden Bee .049, in case you are interested.